We are proud to announce our new website redesign for one of our favorite local non-profit groups, Marley’s Mission. As always, we are honored to have had the opportunity to once again work with this organization. Providing equine-based therapy free of charge to children and their families who have experienced trauma, Marley’s Mission is dedicated to making immediate, positive changes in the lives of its patients. 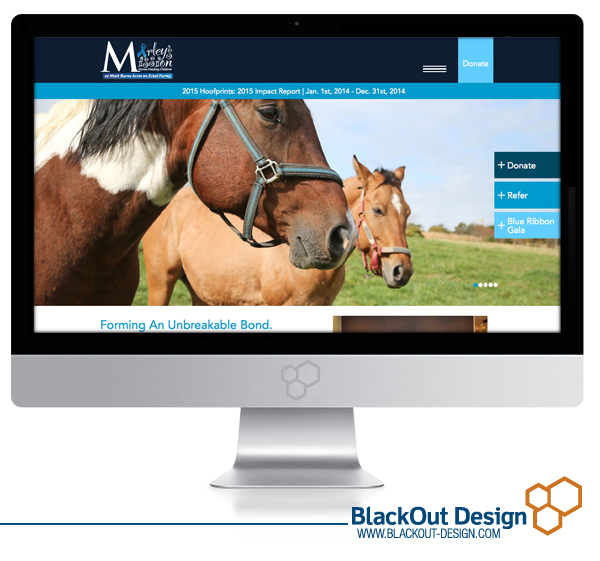 A long-time client, Marley’s Mission came to BlackOut Design looking for a bold, refreshed website design. The end result captures the serene campus and beautiful horses at Marley’s Mission at Matt Burne Acres on Eckel Farms through the use of large, impactful photography. In addition, our design includes pages highlighting the events Marley’s Mission hosts, like the well-known Blue Ribbon Gala, along with the functionality to purchase tickets and make donations directly online.